... in August last year during a book event honouring the most popular books of the year. Amir realised that the majority of the 10 best Bahasa Malaysia novels for that year were romance novels. In fact, he was told that most Bahasa Malaysia readers are women, and that the market leaders are romance novels. “I am not going to be quoted as saying that they’re bad or anything, but I just want something slightly different. 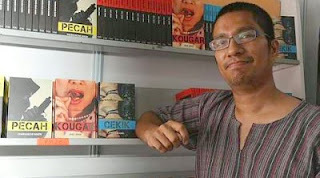 Because a lot of these books seem to be targeted at young, Malay women – but what about the rest of the population?” asks Amir. “It can’t be true that all young Malay women have all the same taste either,” he adds. He knows of some women writers who told him that they’d tried to pitch a certain idea to a publishing company only to be told that they want only love stories. “Some even have strict guidelines like ‘the bad guy must not win’ – it’s a market caution thing,” says Amir. i had read some of the tittle published by Fixi. and they are such great reading materials! Even my male friends are now starting to pick up this hobby.